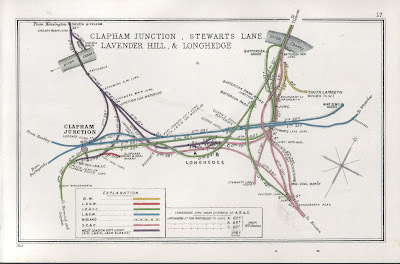 It’s interesting to consider the things that this railway map of 1912 has in common with Henry Beck’s Underground diagram. Of course there is the colour coding of lines, but this map retains the cartographer’s use of pastel colours bounded by black outlines rather than the graphic border-less lines of Beck. At first sight, it appears to be geographical, and it’s easy to check this as most of the lines still exist. 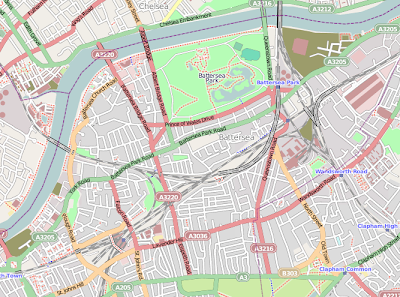 Laying an image of the map over a map from www.openstreetmap.org reveals that, in common with Beck, the complex central area is expanded, and the contextually important, but less complex outer extremities are compressed. The curvature of the lines that exit from the map is exaggerated, the orientation is amended to make the central area almost horizontal, and the Thames is reduced to contextualizing fragments where the lines cross it. 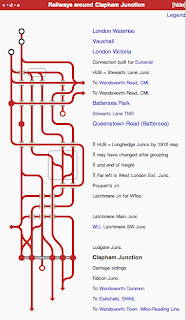 I’m not sure that the current Wikipedia visualization of these junctions is an improvement! ¶ If you’re unfamiliar with pre-metric British measurements, m = mile and c = chain (= 66 feet/22 yards). Because track distances were historically recorded in miles and chains, the unit is effectively still in use on Britain’s railways – take at look at the retaining wall on your left as you leave Paddington for the West. ¶ Rob Waller discusses some related ideas about stressing the important bits of a visual message here.